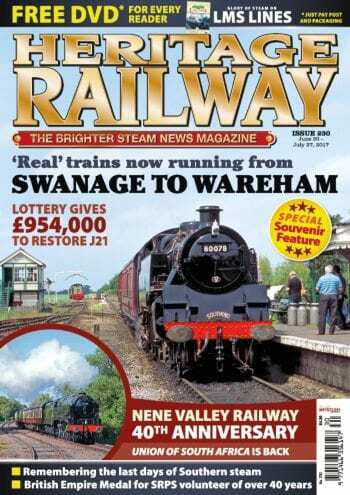 Lottery awards close to a million pounds for the restoration of NER J21; Great Central needs another £100K for Loughborough bridge project; royal approval for Post Office heritage railway project; Edinburgh plaque tribute to Sir Nigel Gresley and encouraging figures for first week of Swanage Railway’s Wareham services. British Empire Medal for lady with more than four decades of service with Scottish Railway Preservation Society; Tornado sparkles in Cornish debut; four locomotives return to steam: Isle of Wight Ivatt 2-6-2T No. 41313, BR Standard 4MT No. 80078, Peckett Jurassic and Nidd Valley survivor Illingworth/Mitchell; Queen’s Award for Voluntary Service for six venues; steam railmotor’s Chinnor visit postponed; South Devon engineman with 63 years of service; new Gresley P2 crank axle completed and the Yorkshire miniature railway that carries real freight. Union of South Africa back after 18 months – but starts fire on light engine move; Leander comeback despite problems; Clan Line painted green in readiness for relaunch and West Coast Railway’s ‘Jacobite’ appears on new banknote. Don Benn reports on high speed Southern steam performances on the Southern in the Sixties. Union of South Africa at London Victoria by Sekine Eiki. 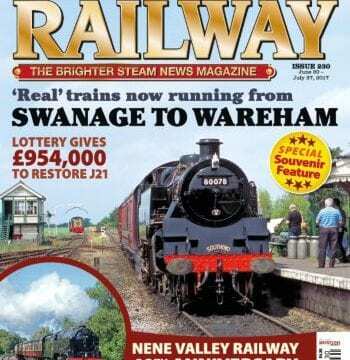 Steam and heritage diesel railtours. Where your views matter most. Free Glory of Steam LMS Lines DVD offer for every reader. Guide to railways running in July.